Artwork Panel: 28.3cm x 41cm ≈ 11" x 16"
Silk/Brocade: 37.3cm x 103.6cm ≈ 14¾" x 40¾"
This depicts the most famous scene from the series, "One Hundred Aspects of the Moon". The Japanese title is, "Inabayama no Tsuki". Incredible, dramatic night scene showing Hideyoshi bravely climbing a hidden route to the Gifu castle. The daring plan to take the castle was successful due to Hideyoshi's ingenuity and courage. A huge moon dominates the scene placed low in the print to give the image weight. The moon backlights susuki grass - combining two of Yoshitoshi's favorite design elements. 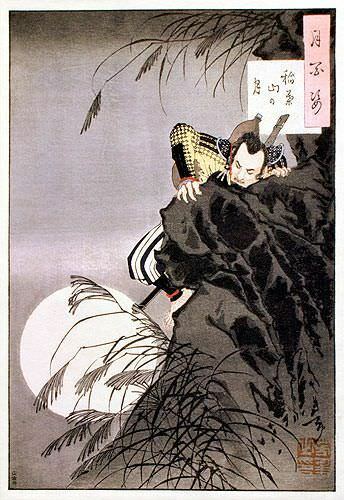 Hideyoshi carries a long katana stretching from the moon to the title cartouche in the print. Tsukioka Yoshitoshi (1839-1892) was a Japanese artist. He is widely recognized as the last great master of the ukiyo-e genre of woodblock printing and painting. He is also regarded as one of the form's greatest innovators. This is a giclée print reproduction of a very old Japanese woodblock print. It's a beautiful reproduction of a centuries-old piece of Japanese art and history. Original artist: Tsukioka Yoshitoshi (1839-1892). Original woodblock was created in Japan, around 1885.